Esophageal neuroendocrine cell carcinoma (NEC) is extremely rare, and its treatment strategy has not been established. 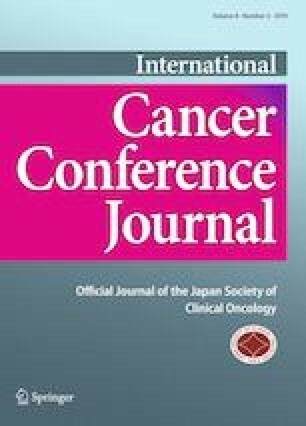 Systematic review and meta-analysis were carried out to assess the treatment and prognosis of patients with esophageal NEC in Japan. The Ichushi-Web database was searched from January 1964 to May 2018. In total, 141 cases of esophageal NEC were included in the analysis. The survival of the chemotherapy group with stage II/III esophageal NEC was better than that of the surgery group. Meanwhile, the survival of the adjuvant treatment group with stage II/III esophageal NEC was significantly better than that of the surgery alone group. In patients with stage IV esophageal NEC, no significant differences were observed in terms of treatment response from the three regimens: irinotecan/platinum and etoposide/platinum compared with 5-fluorouracil/platinum. Moreover, no significant differences were observed in the survival of patients who received the chemotherapy regimens. However, the 2-year survival rates of the irinotecan/platinum (26%) group and etoposide/platinum (27%) group were higher than that of the 5-fluorouracil/platinum (0%) group. In esophageal NEC, chemotherapy may be used as the first-line treatment. Irinotecan/platinum or etoposide/platinum can be the first-line regimen for chemotherapy. However, the additive effects of surgery remain unclear. Ethical approval is not required because all data in this study uses Ichushi-Web database. Informed consent is not required because all data in this study uses Ichushi-Web database.